Dondi co-creator and artist Irwin Hasen died March 13 at the age of 96. 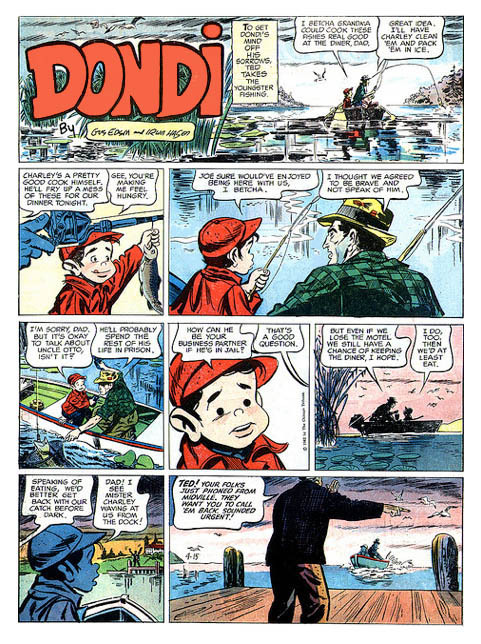 A comic strip about a war orphan, Dondi was co-written with Gus Edson and ran in more than 100 newspapers from 1955 to 1986. When it was filmed, Hasen had a cameo as a police sketch artist who drew the missing Dondi while the cops were searching for him. Just before World War II he created the feature Citizen Smith, Son of the Unknown Soldier. While in the Army from 1942 to 1944 he managed the Fort Dix Post newspaper. Since he was stationed in New Jersey, sometimes he could get away to do comics work. In 1944 and 1945,Hasen drew a comic strip adaptation of The Goldbergs radio series for the New York Post. He also had a long Golden Age career working on Green Lantern, and co-creating Wildcat and Wonder Woman covers. He met Alfred Bester a couple of times when Bester was writing Green Lantern stories. One illustration depicts a veritable harem of past girlfriends — all tall, buxom and naked. Drawn tiny in the corner is the laughing Mr. Hasen, bringing in a tray of martinis. This entry was posted in In Passing and tagged comics, Irwin Hasen by Mike Glyer. Bookmark the permalink. Those who have known me a long time will be surprised to know that I have a shy streak… And that I won’ t necessarily go up to a celebrity, or quasi-celebrity, just to say, “Hi.” But outside the Big Apple Con, a few years ago, on Seventh Avenue, in front of the Hotel Pennsylvania (across, of course, from Madison Square Garden), I had stopped to say hello to an old friend, when Mr. Hasen seemed, ahem, drawn to us…. We began chatting,and he seemed surprised that I remembered an appearance he made on the TV talk show of his old friend, David Susskind… DONDI was a lovely part of my childhood weekends, his adventures emblazoned in my memory, on the back page of THE SUNDAY NEWS! Between THE NEWS, THE NEW YORK KNICKERBOCKER, and THE LONG ISLAND PRESS, the late ’60s and early ’70s was the last era when one could read just about all the classic comic strips, as they were still being produced. “Wow, another of my teachers from my Kubert School days gone. Sad news, but nice to know he had a long and rewarding life. “I didn’t know him as well as some of the other teachers, since this was just one class for one semester, one year, but he was a really nice guy, and an incredible artist. This was a couple of years after his DONDI strip ended, 1988-89. 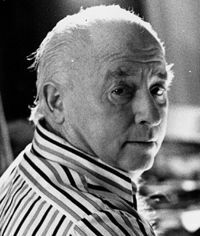 One thing I remember he taught us, when doing black and white artwork, if you wanted to depict falling rain in a scene, you dragged the corner edge of a razor blade repeatedly across the finished inked artwork, and the scratches would look like driving rain. I also remember when we were all in class, quietly working on an assignment at our desks, he’d often go for a little stroll down the halls (Kubert School was/is in an old public high school building, circa 1930s/40s), looking at all the framed original art from his heroes and peers– Milton Caniff, Hal Foster, Alex Raymond, Roy Crane, Burne Hogarth, Joe Kubert, etc– that lined those halls. Also, if he liked your homework, he’d always say, “Damn good! Damn good job!”, which became sort of a catch-phrase in our class.